Only the Mountains Do Not Move is a photographic essay about a Maasai tribe in Kenya, Africa, as it adapts to changes in lifestyle, land, and farming practices. 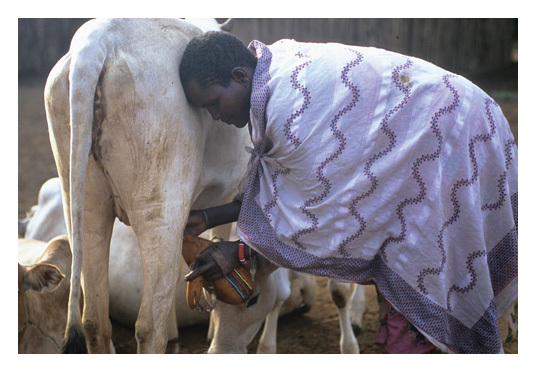 In this BookTalk, Jan Reynolds discusses living among the Maasai and professional photography. Your book focuses on a Maasai tribe from the heart of East Africa. What has your personal experience been with the Maasai? What made you choose this tribe in particular? Had you ever visited them before making this book? Jan Reynolds: I had heard of the Il Ngwesi (il ngwesi), which means "the people of wildlife," in passing. I heard that the people were trying to maintain the environment surrounding them while also maintaining their culture. So I thought that I might see more of traditional life, less affected by the outside world, in their area, as opposed to more heavily traveled national parks. I had not visited the Il Ngwesi before this book project; I went to meet this tribe specifically to do the book project. My experience with the Il Ngwesi was so playful and fun. The people are all so grown up, but very humorous in attitude, and adventurous by nature. As for your other books, for this book you lived for a time with the Maasai people you were writing about. How did you walk the line between getting to know them and maintaining distance as an objective photojournalist? JR: I don’t try to maintain any objective journalistic distance; I go to make friends and learn from the people I visit. So I get to know them as my friends, not as subjects, and usually maintain the friendships over time and visit again. Right now I’m helping the Il Ngwesi tribe build some schools for the children, so we will see each other get old, over time! Only the Mountains Do Not Move is comprised of beautifully authentic photographs. How did you go about obtaining these pictures? How do you make the people you photograph feel comfortable in front of the camera? JR: I mostly spend my time just hanging out with everyone, or helping with whatever work is going on, and because we are developing a friendship the people seem to be okay with me taking pictures. They seem to know that this is my work, while they show me their work. The children like to spend the most time with me; they never seem to tire of seeing the odd things I mess around with from my backpack, like camera gear and such. How many rolls of film or digital photographs do you take during an average trip? JR: This was my first book in which I went digital. I shot most of it in film, then returned and shot some digital, and merged the two in the book. I take hundreds of photos, and it can easily mount up to thousands over time. 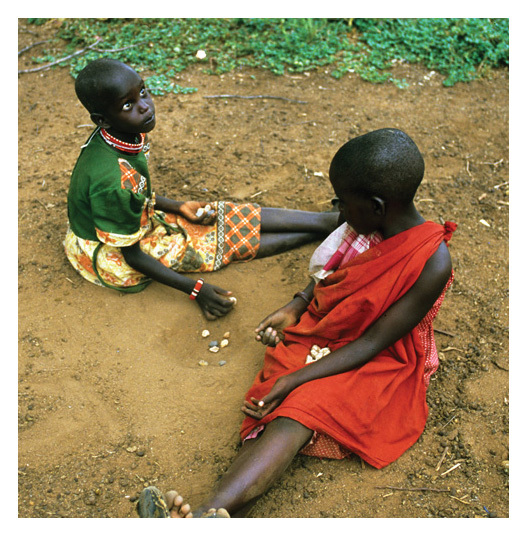 There are a few Maasai proverbs sprinkled throughout the story, such as, "One finger does not kill a louse." Did you have a hard time translating these into English, or did you find that their lessons translated easily? JR: The warriors of the tribe did the translating for me right in the field while we were herding and looking for wildlife. They would talk among themselves when I’d ask for some clever sayings, and when they came up with some they all knew, they would laugh trying to agree on a translation into English. We would eventually get a good translation by acting it out, and figuring out the best words to use. In the story, the people and animals share the land, and the book emphasizes a balance of needs. What does this message mean to you personally? How do you think it relates to your readers living in other parts of the world? JR: All of life is a balance, and it seems to me that the people who live close to the land and the animals truly experience this balance in their day-to-day lives. I appreciate this tribe’s sensitivity to changes in this balance, and the people’s willingness to change themselves and their ways to maintain the balance. It’s a lesson we all should learn. We in the developed world have so much more material wealth, in comparison to the Il Ngwesi, but do we work to adjust our lives to maintain balance in nature to the same degree that the Maasai are willing to. What do you want your readers to take away from the Maasai people? What can we learn from them? JR: I think we can learn from the people of Il Ngwesi that we can all change ourselves, our routines, and our habits to become more environmentally sustainable in the way we live. We can learn to maintain the balance of nature. At the end of the book you mention that you traveled to Kenya with your twelve-year-old son. What was it like to bring him along? JR: Bringing my twelve-year-old son along was just great because it gave us all permission to act like twelve-year-old boys, running around investigating everything, laughing, playing, making jokes, and just plain having fun. The warriors were full of pizzazz. Being with my son Briggs gave them license to indulge in being silly and adventurous, which is right up my alley. I was lucky because I wasn’t treated like some fancy, elderly lady; I got to get down and dirty too. In the author’s note, you end with the question, "What will happen to their future?" 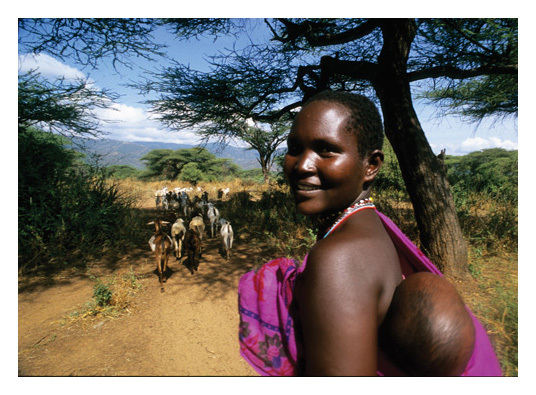 How do you envision the future of the Maasai people and the animals and lands they depend on? How do our lives here in the United States affect the Maasai people? JR: I’d still like my ending of the book to be a question, so I hesitate to answer what will happen to their future and shape the discussion that should ensue. I want readers to think and discuss what they think will happen. Any developed country affects a developing country by the products it buys, the wages it pays, and the aid the country’s government chooses to give. Our lives affect the Maasai when we buy coffee from their country and pay a fair price for it, when our government sends aid for schools and medical clinics, when we buy the music and clothes they produce. Where are you planning to visit on your next big trip? JR: My next trip is to go to the Himalaya and to bring the mountains back to you all through live webinars—free!